Your Christmas gift from me...an apron in an hour! - Stop staring and start sewing! Your Christmas gift from me...an apron in an hour! 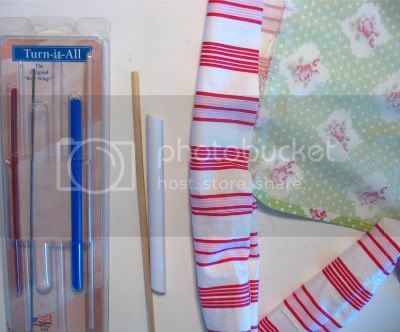 Apron in an Hour tutorial. Editors addendum: I've just converted the tutorial into a downloadable pdf file (and my pillowcase tutorial too)! Print it out and have fun sewing! Well last year I gave my fabulous readers (that means you!) a cookie recipe as my gift (pretty picture of the cookies here at Heather's blog). 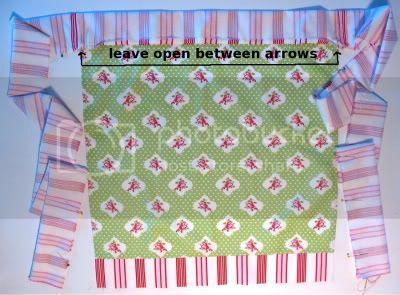 And since I've received so many requests for a pattern of the apron from my previous post, I've decided to make this tutorial my gift to you. And you still have plenty of time to use it for some impressive gift giving! 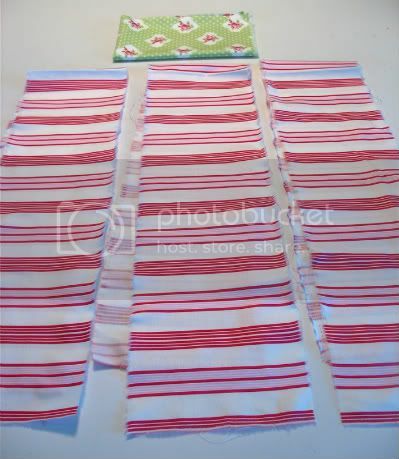 This apron is great (if'n I do say so) because it only requires one fat quarter (the floral in this one) for the main apron piece and 1/2 yard of fabric (the stripes of course!) for the waistband and ties. 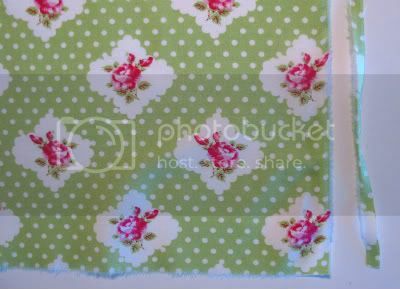 Pleeeeeeease remember, your apron is only going to be as pretty as the fabric you use so be sure to pick some fabrics that you love and you will love the apron you make! 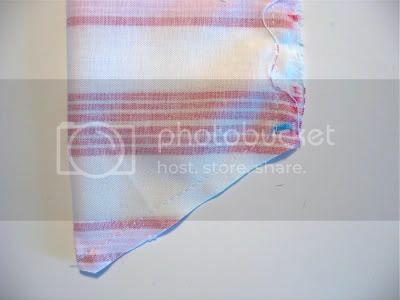 Remove the selvedges from your waistband fabric. I just snip the end and rip it off so it stays on grain. 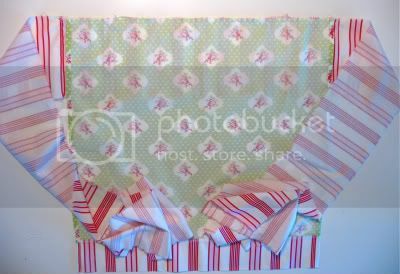 Lay your fabric down and make snips (about 1") at 6" and 12". Now rip your fabric (yep, rip it!) into 3 equal strips. 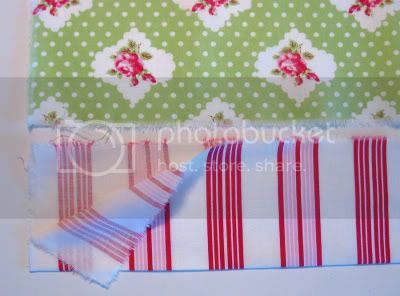 You can cut your fabric, but ripping it keeps it on grain and makes it go a lot faster too. 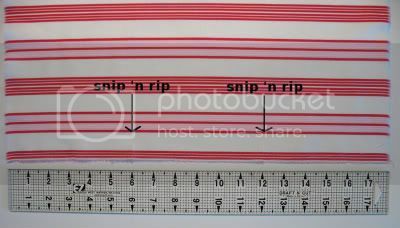 So now you have 3 strips (6" x 44") and one fat quarter. Snip and rip the selvedge off your fat quarter piece now. Take one of your 6" waistband strips and cut a piece off the same width as your fat quarter (22" or thereabouts, not the 18" side). 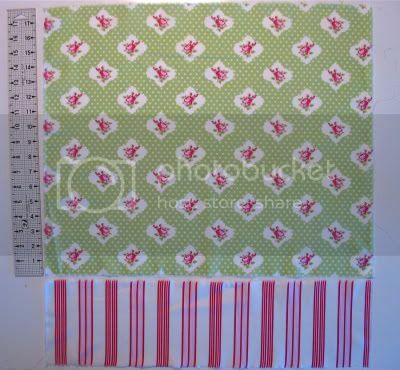 Save the remaining length of this waistband strip for later. 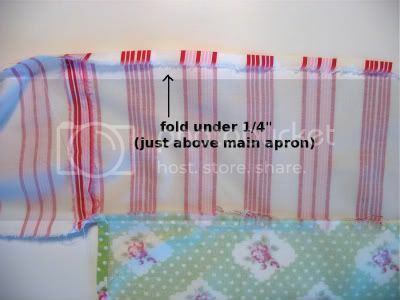 Fold your strip in half and press well. 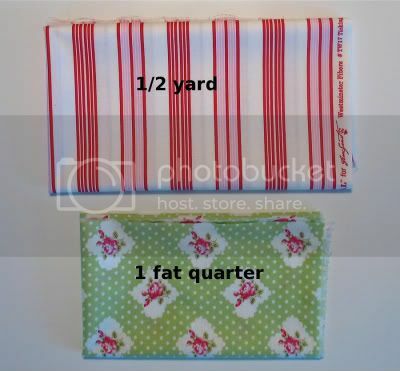 Now put your fat quarter and folded strip together (on the right side of your fat quarter) so the raw edges all match up. Stitch in place using about a 1/3 inch seam allowance. Press open (seam allowance pressed upward) and topstitch. 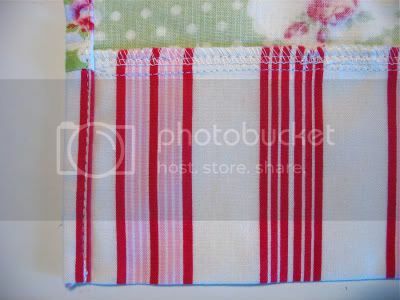 Now hem your sides by folding over twice (press each time) and stitching. 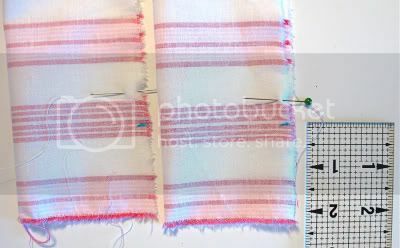 Now take the remaining piece of the waistband strip (the one you cut for the bottom of your apron) and pin the two long pieces to each side. 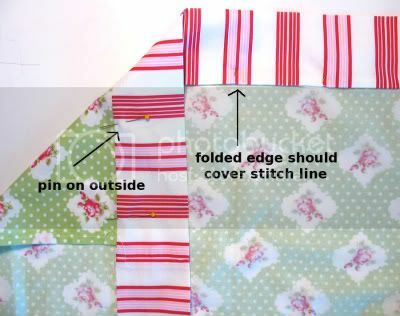 Stitch both seams and then press them open. 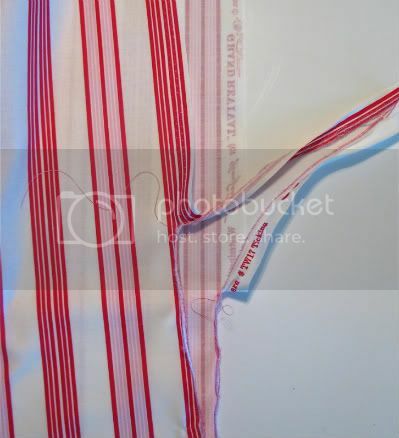 Now lay your main apron piece on the center piece of the waistband, right sides together (be sure to center it evenly) and stitch pieces together across the top of the apron piece using a 1/3" seam allowance. 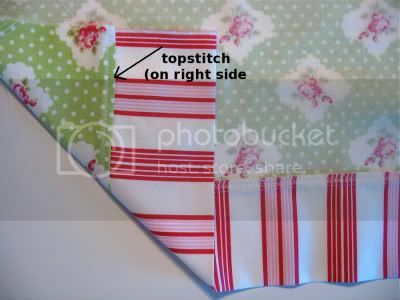 Fold and press the unfinished edge of your waistband strip directly above the main apron piece (just fold the part above the apron, not the whole length of the waistband). 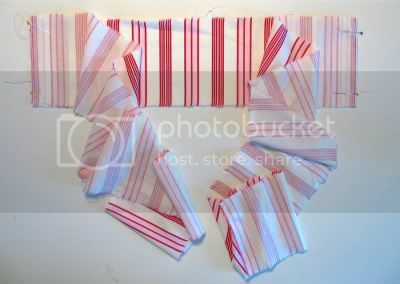 Fold the waistband strip right sides together, matching raw edges. Pin both sides but leave the center above the main apron piece open. At the end of each waistband strip make a mark 2 inches up from the bottom (I used blue disappearing ink). Now stitch your waist ties starting at the main apron piece. 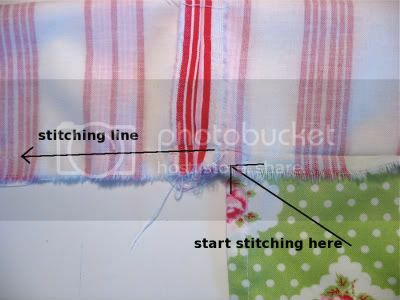 When you reach the mark you made (2" up from the bottom) lower your needle, pivot, and stitch a straight line ending just above the corner where the fold meets the raw edge. 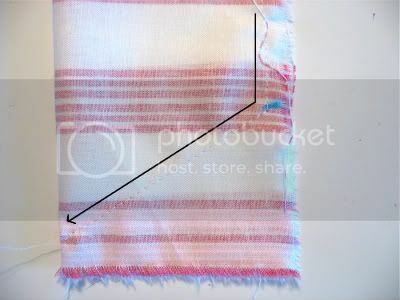 Trim the extra fabric away below your stitch line. Turn your ties right side out (I use my Turn-it-all tool, which I love). Now press your ties nice and flat (take your time so you get a nice crisp edge). 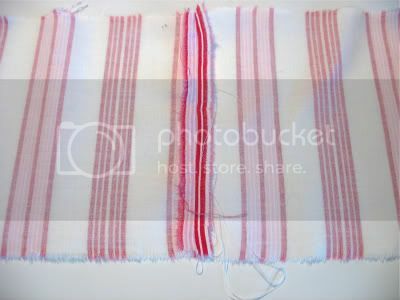 Fold the unsewn part of the waistband over so that the folded edge covers the stitch line. Pin in place on right side (use lots of pins). 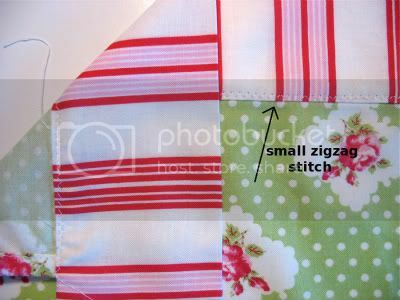 Now use a small zigzag stitch on the right side of your apron and stitch all the way across the top where the main apron piece meets the waistband piece. 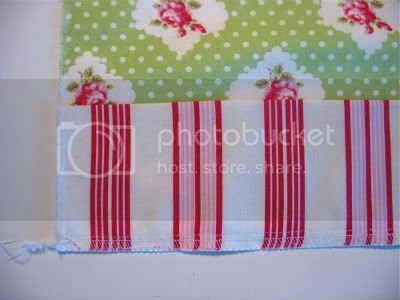 Trim all your loose strings and iron your apron. Now you have a lovely gift for a very special person and they don't need to know that it only took you an hour. 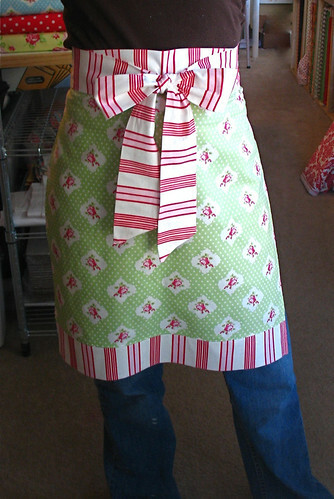 Or you can keep it for yourself and look oh-so-sassy while doing your Christmas baking! 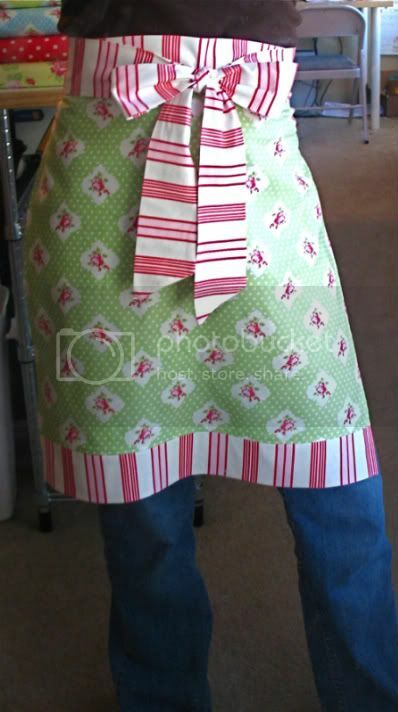 If you make this apron I'd love it if you added it to my Flickr group! I really want to see what everyone comes up with! Thank you!